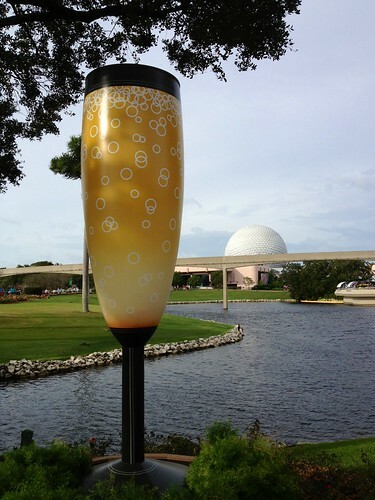 One of my favorite EPCOT "small treasures", originally uploaded by Erin *~*~*. The jacaranda are are still blooming and smelling fabulous. Merry Monorail!, originally uploaded by Erin *~*~*. It was raining all over this shot last night; this one’s much better! I’m here! 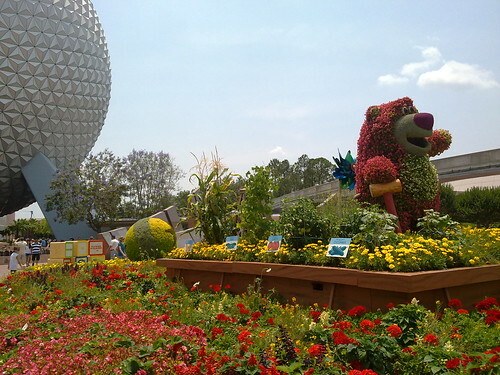 EPCOT’s 2011 International Food and Wine Festival, originally uploaded by Erin *~*~*. I wonder if the plane is supposed to be a tie-in with ABC’s "Pan Am"? 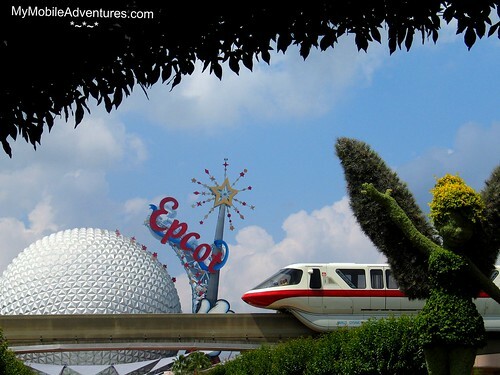 😉 this shot definitely needs a monorail behind it…. Wait time posted at 15 minutes, but…, originally uploaded by Erin aka Tink*~*~*. 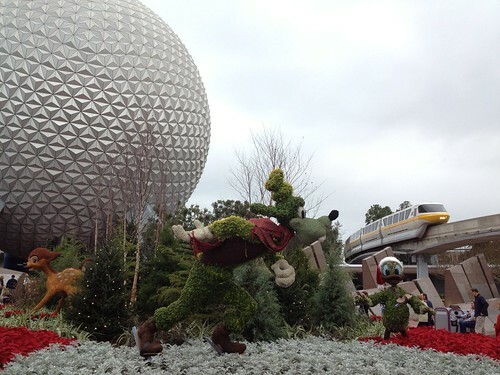 Wonder if Spaceship Earth is still running? 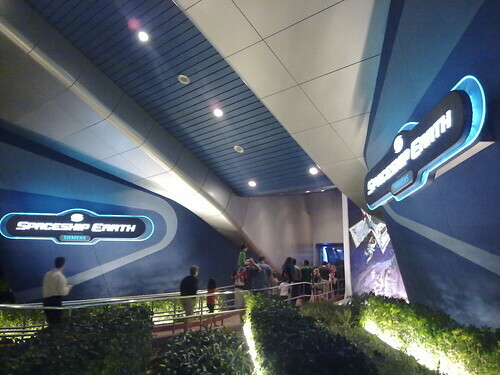 Wonder if Spaceship Earth is still running?, originally uploaded by Erin aka Tink*~*~*. 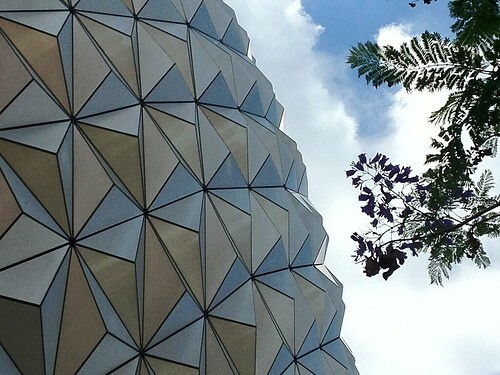 Geosphere As Art, originally uploaded by Erin aka Tink*~*~*. 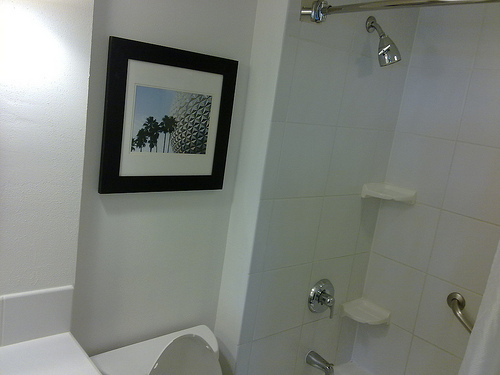 Gotta love a Universal hotel that features EPCOT over the toilet LOL 😉 It smells great on this floor – they must be pumping in some scent like at the Swan (Eau Du Swan). Will find out what it is and report back! 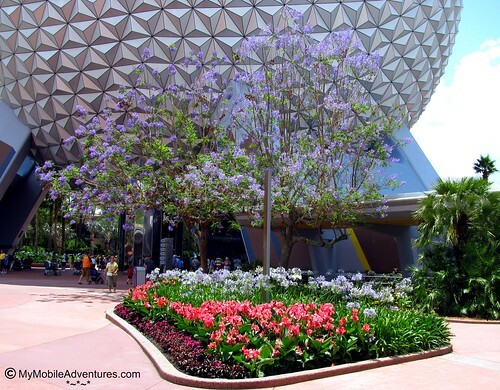 There are some wonderful flowering trees that bloom in the spring, just in time for Disney’s annual International Flower & Garden Festival at EPCOT. They bloom at varying times during the spring season. Here’s a sample from the front entrance of the park. In May, you can see the jacaranda trees in bloom. 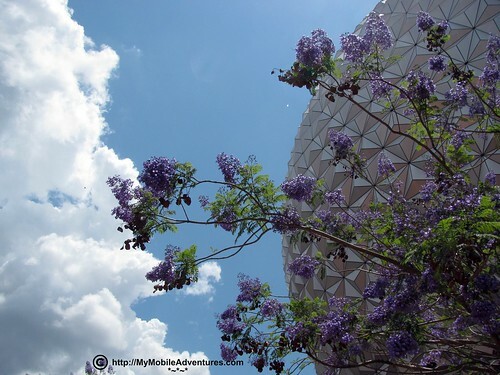 Planted in clusters near the geosphere, their misty lilac color melts into the steely gray of Spaceship Earth. They smell heavenly 🙂 The bees like them even more than I do, so there’s an opportunity to observe them in the act of collecting pollen. 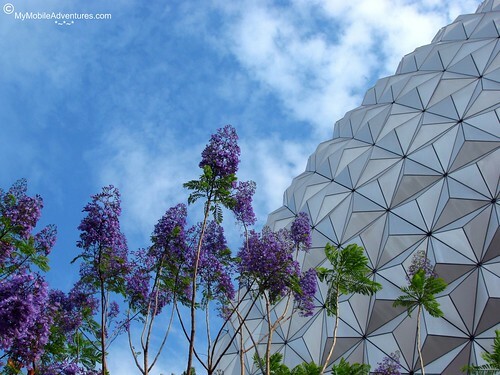 Here’s a closer view of the jacaranda blooms with the geosphere and the sky as a backdrop. Just one month later in June, the jacaranda have already stopped blooming – but the crepe myrtles are now in full force. These vines have been expertly woven over time into beautifully shaped trees. 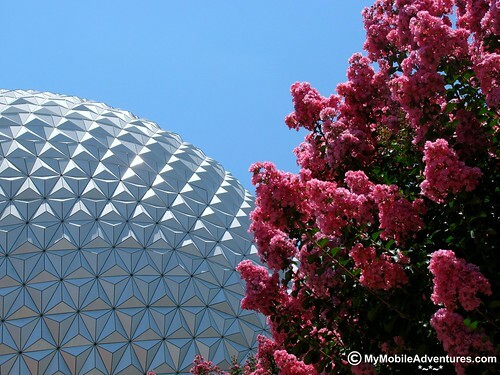 These bright pink ones stand in stately rows alongside the Leave A Legacy monuments near the geosphere. I’ve seen white ones scattered throughout the park too, most notably by the French pavilion. 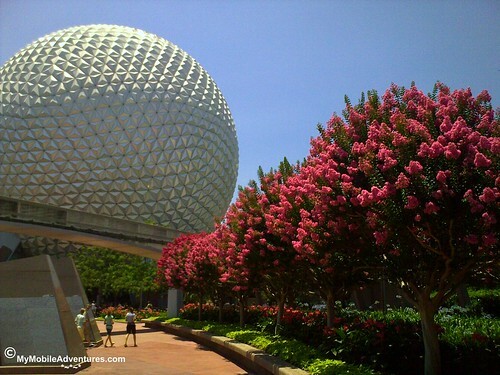 A closer view of the crepe myrtle blooms against Spaceship Earth. 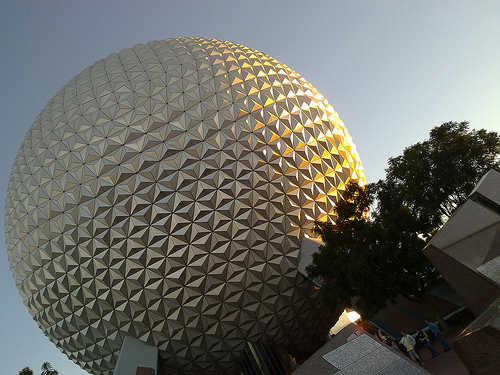 Last light of day shines on the geosphere, originally uploaded by Erin aka Tink*~*~*. Piped in Christmas tunes – medieval-sounding "We Three Kings"
At the end of the Spaceship Earth ride in Walt Disney World’s EPCOT theme park, you get to choose a bunch of options on the touch screen of your vehicle. After that a little movie plays based upon the options you picked. Then, when you disembark, you have the opportunity to email the video to anyone you want, including yourself. I used this technology as a fun little “fortune teller” about my future employment, just to amuse myself. This is what came out. No, I have no idea who the surfer dude is! SUBSCRIBERS: if you do not see a video below this sentence, please click through to the blog to view it. 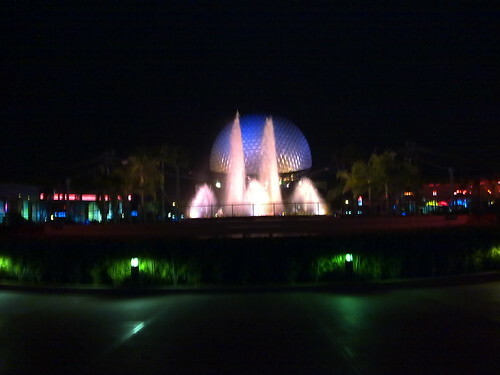 Just poking around, I found some video of Spaceship Earth while the fountain show was in progress – watery goodness, coming your way! SUBSCRIBERS: here comes another video! 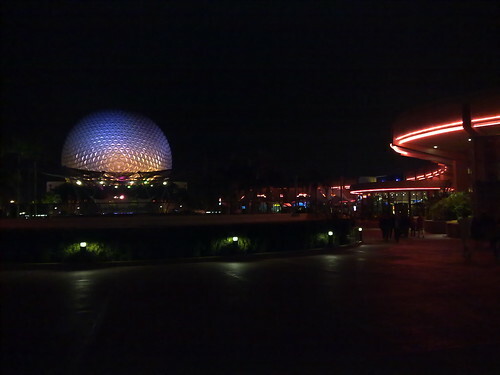 Making my way out of EPCOT, originally uploaded by Tink*~*~*. 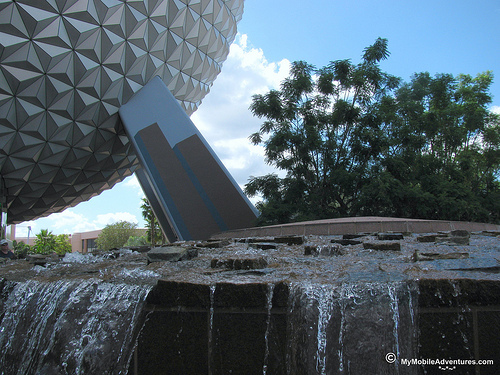 I like this fountain – it’s right in front of Spaceship Earth as you enter the park from the front/monorail entrance. Unfortunately, the view of it from the front of the park is obstructed by those silly Leave-A-Legacy “tombstones” (c’mon, those of you who have seen them, don’t tell me that the whole thing doesn’t sort of remind you of a cemetery!). 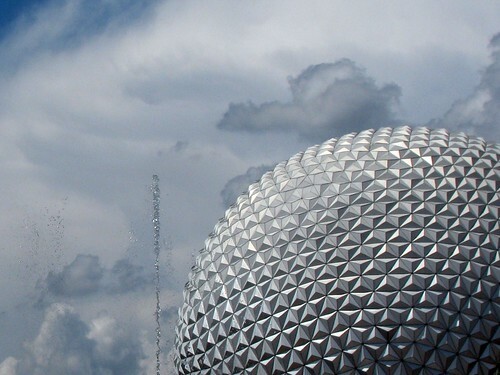 Maybe someday, Disney will restore the entry to EPCOT and move the silly monuments to someplace where they won’t mess with the scenery! A Tinker Bell topiary twirls before the Spaceship Earth geosphere, just as the monorail passes by. 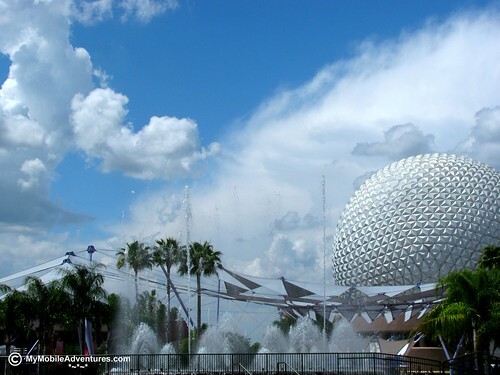 EPCOT at Walt Disney World – blue, yellow, CANDY! “Candygram… Landshark!” OK, who besides me is old enough to remember where that line came from? 😀 No googling now, that’s cheating! My oldest niece LOVES Pocky. Last May I picked some up in the Japan pavilion at EPCOT and mailed it to her. I guess you could say I sent her a candygram. Unfortunately, it melted in the heat, but she says it was still edible! Don’t tell her but I think it might have been melted BEFORE I mailed it and not enroute. 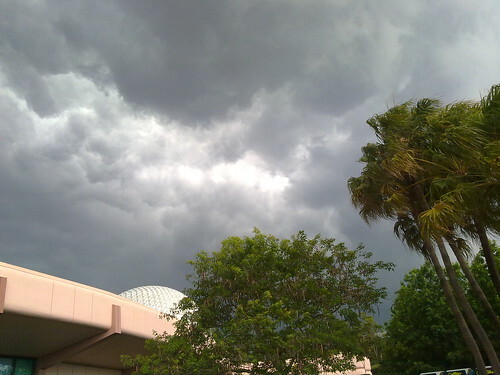 I did make a stop at Downtown Disney on the way home, with the candy in my luggage, and it was pretty hot that day…. 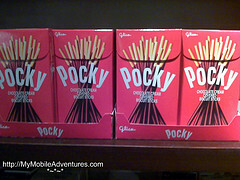 Since then, she has discovered a local place where she can buy Pocky unmelted. I bet she’s relieved! Universe of Energy Ellen Degeneres stars in this attraction, along with Bill Nye The Science Guy. It’s an informative show, and I like the message about different ways to produce energy besides fossil fuels. 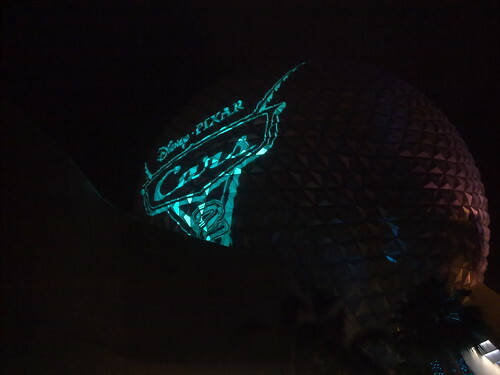 It’s my big ambition in life to get this same shot, only with the monorail going by. And everything is in focus. Well a girl with no schooling or skill in photography can dream, can’t she? 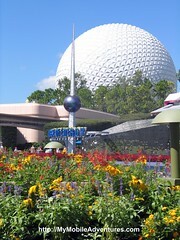 I love the cobalt blue of the Universe of Energy icon contrasting with the yellow of the flowers. Blue and yellow together have to be one of the world’s best color combinations. But ma, I swear, it SPOKE to me! This festive-looking trash receptacle is primarily a teal blue and a golden yellow. 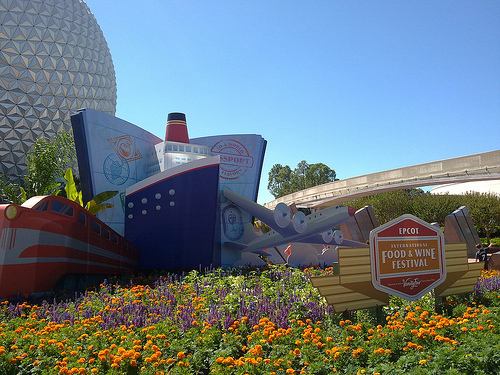 It was found in the 2008 Food and Wine Festival center, which was located in the former Wonders of Life building. It’s fun, but at the same time a shock, to walk into an attraction that used to be all about little kids, and find it filled with racks and racks of international wines! Some of the trash cans at Walt Disney World talk – this isn’t one of them, but there IS one in EPCOT. 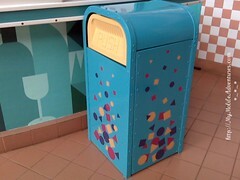 Can you name the places in Walt Disney World where you can find a talking trash can? 2008 Food and Wine Festival Disney went for an Alice In Wonderland tea party theme for last year’s Food and Wine Festival. It was lame. 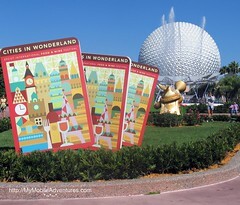 I’m not saying Alice In Wonderland is lame; the execution of the theme for the festival was lame. It was so painfully obvious that Disney did it on the cheap. Totally not up to their standards, IMO. I waited for this shot and I’m happy with it. 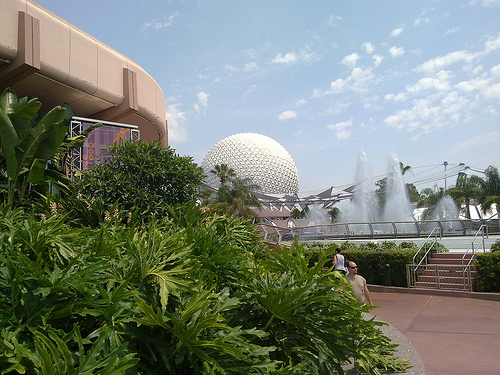 The fountain show was going on and I caught the spray in front of the geosphere/Spaceship Earth, with the scene from Alice In Wonderland in the foreground. 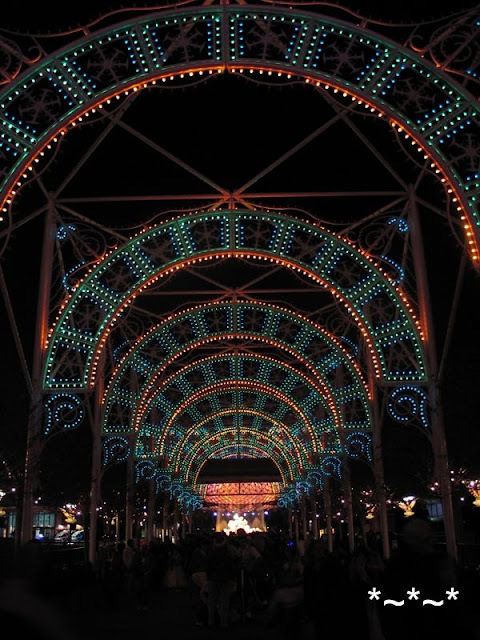 Someone on the Disboards forums remarked that they had never seen the tunnel of holiday lights through which one can walk from Future World into the World Showcase during the holiday season at Walt Disney World’s EPCOT. I knew I had photos somewhere, and I even had a scan of the festival guide (see at left), too! 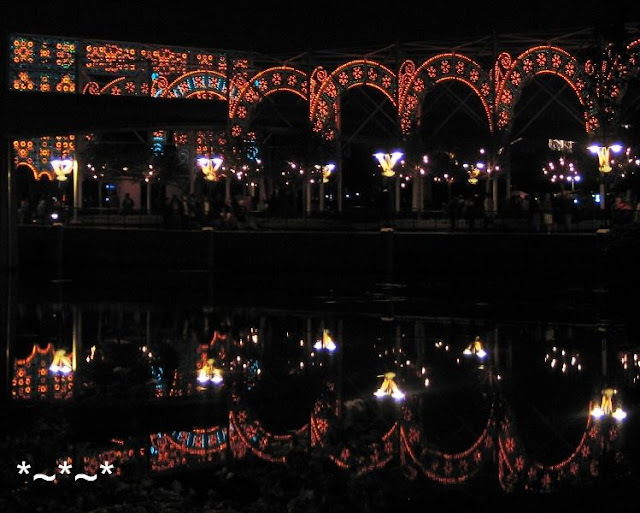 This holiday display is not only amazing eye candy, it’s a photographer’s dream. I am by no means anything beyond a point-and-shoot type myself, but with the way digital cameras operate today, even I was able to get some pretty cool shots of this wonderous display. I mean, the only thing that’s missing is the snow! Um, NO, I am not wishing a snowstorm on sunny Florida during the holiday season, or any time soon; we get enough freakish weather ’round these parts, thankyouverymuch! This reminds me, I need to make some hotel reservations for early December, as I’m taking a professional certification exam in Orlando and want to spend the rest of the weekend taking in the holiday decorations at Disney World. Putting that on my To Do list for this weekend. For those who haven’t seen this before – happy viewing! And I hope you get to experience this yourself sometime, too! Here’s a side view, with the reflection in the lagoon that I was talking about in my post on the Dis. 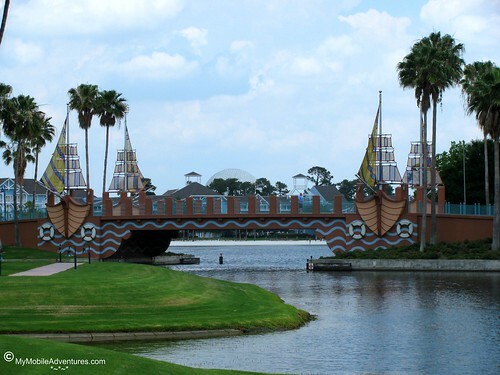 In this view, you can see that the “tunnel” is really a series of arches strung together along the walkway from Future World into World Showcase. Finally, my favorite shot! This photo becomes my desktop wallpaper around the holidays. I think I will have to re-take the photo this year, because the Hand Of Mickey has been taken down, so it will be a whole different shot now. 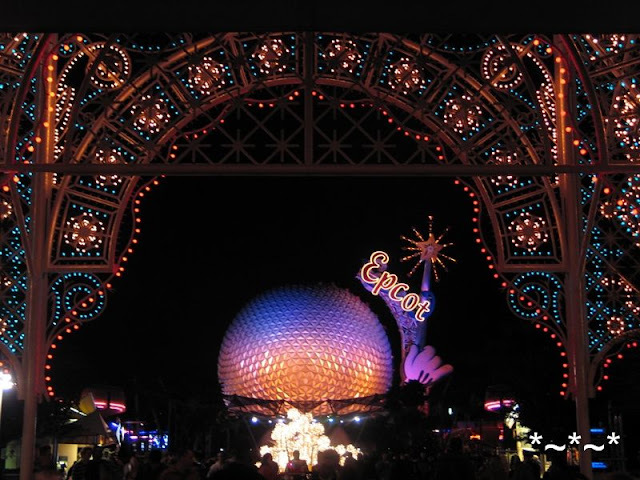 Does anyone else have photos of holiday lights at any of the Disney parks? I’d love to see them! Please leave a link in the comments so I can check out your photos. Thanks!